Wayne Schmidt's Newest Kaleidoscope Page Pictures and construction details of some of Wayne Schmidt's better kaleidoscopes. Visitors to the MY KALEIDOSCOPE and KALEIDOSCOPE MIRROR DESIGNS pages will know that I am new to the art of kaleidoscope making. Those two pages chronicle my efforts to learn the basics of how to make kaleidoscopes. This page showcases some of the new kaleidoscopes I've made since completing those pages. While there is only one scope on it so far, I plan to add to this page on a regular basis and hope that any visitors will check back from time to time. The first kaleidoscope is titled String of Pearls, after the Glenn Miller song of the same name. It's a simple two-mirror kaleidoscope where you look in toward the mirror joint instead of down along the joint. The object is a 1-inch diameter pearlized glass sphere filled with crystal beads resting on a bed of royal blue velvet. This creates a string of pearl-like images, hence the name. What makes this kaleidoscope somewhat novel is that the illumination comes from the inside of the pearl and changes in brightness in synchronization with music played on a built-in tape recorder. The color of the light coming from the pearl also changes from red to yellow, green, white, purple, blue, and orange. One of the problems that had to be solved was getting uniform illumination from the pearl. 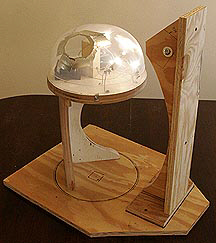 I tried several schemes involving etching or painting the glass sphere but the best results came from filling it with very small crystal beads (though I admit this makes it look less like a pearl than what was desired) and directing the light into it through a frosted conical lens fabricated from a 2-inch length of glass rod. To make the brightness fluctuate with the music, I took the signal to the speaker and fed it to a battery powered set of amplified speakers, cut the speakers off and connected the wires to a maglite bulb positioned close to the flat end of the cone lens. This provided light that not only turned off and on with the beat of the music, but also varied uniformly in brightness as quiet or loud passages played. This worked well but many passages were so quiet that the light went off altogether leaving the kaleidoscope in complete darkness. This problem was solved by positioning a second light that was always on next to the first. Its brightness was set so that it always provided enough illumination to see the image but not so much that it washed out the pulsating light. And what music did I select to play? Glenn Miller's In The Digital Mood, of course. Though I have to admit that the song String of Pearls itself wasn't too impressive. In The Mood put on a much more entertaining display. 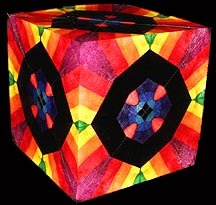 Unfortunately, I decided not to build a permanent box for this kaleidoscope. The bulk of all the electronics made the prototype heavy and unattractive looking. 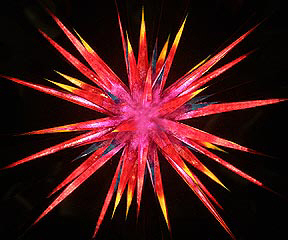 Also, although it was an interesting kaleidoscope, it quickly grew boring once the novelty wore off. 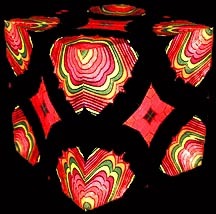 Shortly after making this kaleidoscope I noticed that as with many other scopes, my interest in it quickly dwindled. After pondering this I discovered that this was the case with almost every kaleidoscope I have. Even those with many objects in the object window so that the image is always different still get boring rather quickly. The reason is that while the fine details of the image can vary the basic nature of the image remains the same. The question is how to create an object cell with enough variety so that an observer can spend considerable time at the kaleidoscope's eyepiece without getting bored. 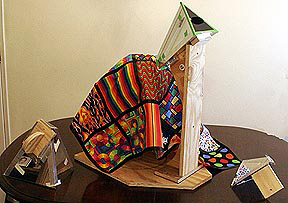 The idea is to use a quilt made out of many different pieces of cloth, each with a bright and interesting pattern, as the object to be viewed through the kaleidoscope. Each segment is connected to its neighbors with 1/2-inch wide strips of black ribbon. This black edging turned out to be the most important part of the quilt because it creates interesting geometric patterns. 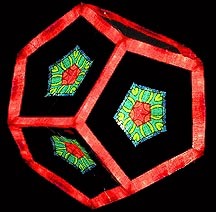 Light shining through the cloth illuminates it making the image in the kaleidoscope appear to glow. The cloth is draped over a dome that houses the lighting system. 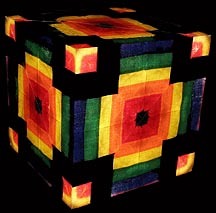 The quilt can be slid and rotated over it to create an almost infinite array of unique images. The best cloth patterns are those with solid, dense primary colors. The cloth should have a tight weave to prevent light from leaking through. Most importantly, the light needs to strike the cloth at an oblique angle. 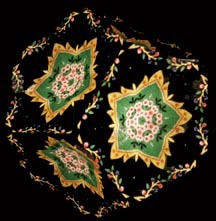 If it shines directly at the cloth a hot spot is created in the kaleidoscope's image that is distracting. This is not the first time cloth has been used as the object for a kaleidoscope, but I do believe that combining many different pieces into an object quilt, using black bordering to emphsize transitions, and using angled lights to illuminate the cloth from behind are unique. How does it work? Take a look! 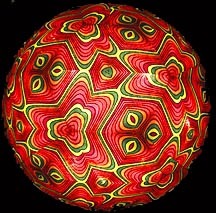 Three images from the spherical kaleidoscope. 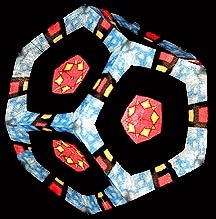 Three images from the cube kaleidoscope. 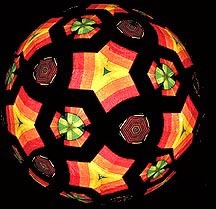 Three images from the imploding dodecahedron kaleidoscope. 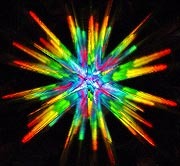 Unlike other kaleidoscopes, I find that I can sit and work with this one much longer without getting bored. Also, because the images are stable unlike oil-filled image cells that constantly change, I can share particularly striking images with other people. One surprise is that the black margins between the different cloth patches in the quilt provide many of the most interesting design elements of the images. All in all I find this scope more satisfying than any other, including the fiber optic kaleidoscope that had been my favorite. 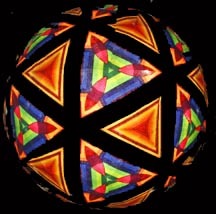 Just for fun, here's what a Borg Lamp looks like through a 3-D spherical kaleidoscope.